What is Pseudoscience and how does it relate to Trepanation? What is Trepanation? Trepanation is a surgical procedure or intervention that drills or scrapes a hole into the huma skull which is meant to expose treat health problems related to intracranial diseases. It is often used to relieve pressure beneath a surface. 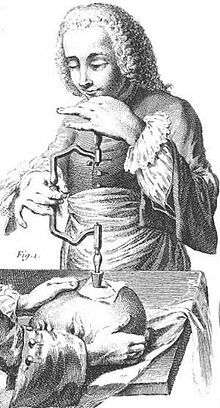 Trepanation derives from the word trephine which is an instrument used for cutting out a round piece of skull bone. What is the purpose or goal of Trepanation? Prehistoric human remains from Neolithic times have shown cave paintings indicating that people believed that this practive would cure epileptic seizures, migranes, and mental disorders. The first trepanations were made because of religious motives and were manifested by the ideas of the supernatural because the trepanation was aiming to remove the evil spirit in some diseases- insanity, epilepsy, and idiotism. The bone that was trepanned was sometimes worn as a charm to keep evil spirits away. 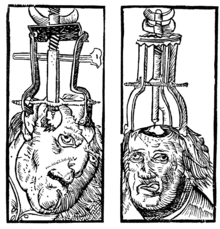 Evidence throughout history has also shown that trepanation would be used as an alternate emergency for head wounds. The ITAG (International Trepanation Advocacy Group) strives for individuals to reach their utmost potential and cnstructive participation in their own lives as well as the well being for the rest of the population. The main goal of the ITAG or trepanation itself is that the modern intervention of making an opening in the skull of an individual's skull favorably alters movement of blood through the brain and improves brain functions. 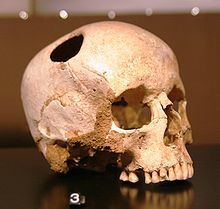 Peter Halvorson drilled a hole in the dront of his own skull to increase blood volume which is known to be the modern goal behind the trepanation procedure. 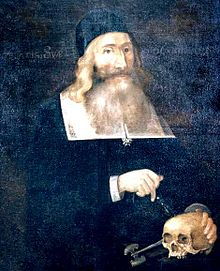 Dr. John Clarke was one of the earliest American doctors who was allegedly the first physicisan to perform trepanning in the United States in 1664. Ever since the first procedure was completed there has been a great deal of discussion and debate as to whether or not these individuals who would even think of placing a hole in their skull are in the right frame of mind to make that decision for themselves in the first place. Can drilling a hole in skulls truly make a difference in the volume and capacity of blood flow that a person's brain can attain and transfer be accomplished by simply making a giant hole within their skulls? Claims of trepanation relieving stress, depression and demonic spirits resulted in the hole in these ndividuals heads for the rest of their lives. Concerns and questions have arisen time and time again. However, because this is a pseudoscientific acquisition and claim there truly is no type of scientific evidence and cannot be reliably tested with statistical answers and claims due to the fact that it simply is a matter of opinion if someone truly feels that drilling a hole in their brain will somehow make their stress, depression, or other mental issues dissipate. After viewing this video, it seems fairly clear that the news broadcasters feel a specific way towards these individuals who have received the trepanation intervention. The patients truly feel that this procedure has made a significant impact in their lives. Ultimately in my opinion, I find this subject to be very interesting in the fact that I do not understand the reasoning behind it. Quite frankly, I believe that anyone who would feel that drilling a hole into their skull (which would permit susceptibility toward their brain, which is what leads human beings to their potential being put in danger), to me may not know what is necessarily best for them to begin with. The rational thinking as well as logic seems a bit vague and almost non existent to these people.Maybe it simply is because I am ignorant to the philosophy of this intervention. Who knows trepanation could be a procedure that we are all missing out on that would truly make our lives better, however, I am willing to take that chance and keep my skull untouched!